Sit and have an espresso coffee and take in the beautiful views of the mountain. 100 square metres of space! The property is fully self-contained and all yours during your stay. 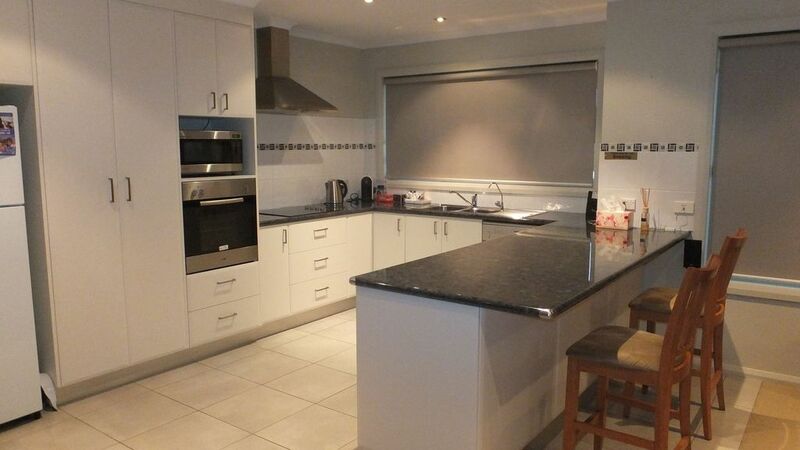 Have a look at our other property Hobart Villa on Queens on Stayz. Peaceful, relaxing place to be. Close to local pool, play cafes, beaches and local shops. The gateway to the scenic Huon Trail. The Margate Train with a lolly shop, gift shop, cafe, fish and chips, and souvlaki. Catch the ferry to Bruny Island for the day. Spend the day exploring the seaside towns of Margate, Snug, and Kettering. Go to the Tahune Airwalk, Snug Falls and Hastings Caves and thermal pools. There is public transport but a car is recommended in this area. Free car parking with carport is included in your stay. We hope you have a great time however, this is strictly a no parties home. We are in a lovely quiet spot and need to be respectful to our neighbours. Please leave the kitchen tidy upon departure, with everything put away as you found it. Unfortunately, an extra cleaning fee may apply for any excessive cleaning required. Thanks very much Jayne. We hope we see you again. This is a beautiful property, very clean, immaculately maintained with quality features including very comfortable beds. As a family of 4, this property was ideal for us as it had the 2 single beds for the children. The view from the front window is stunning. The owners were fantastic, giving detailed information for location and entry to property and friendly follow up communication. The location of the property was great and the suburb of Kingston itself has plenty of options for food supplies, shopping etc. The other bonus is that it has its own beach as well! We found the drive from Kingston in any direction to be easy. We would be more than happy to recommend this property to anyone and would not hesitate to stay here again in the future. I had a very pleasant and enjoyable holiday visit to Hobart. The location is quiet. Only 10 mins drive from Hobart. The villa is very clean and well equiped. Most of the things we took on the trip did not end up using. Living room is spacious. Two good size bedrooms. Ideal place for a holiday stay for a small family. Will definitely go back next year. Really enjoyed our stay, the property was clean and well presented. Would definitely stay again. Well equipped kitchen, relaxing view. Well equipped laundry, plenty of towels. location was good, usually stay in Hobart but Kingston is very easy to travel to and from. Would stay here again.